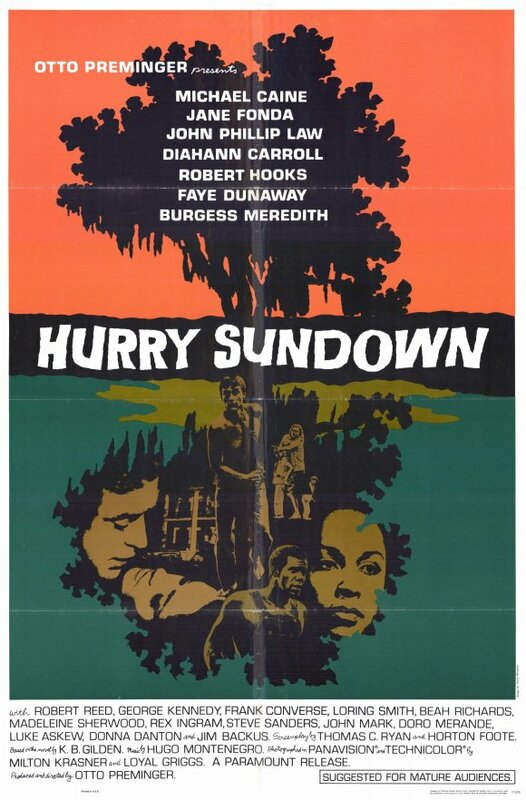 The unscrupulous husband (Michael Caine) of a land-owning Southern heiress (Jane Fonda) attempts to buy out two small plots of land: one owned by his poor cousin (John Phillip Law) and his wife (Faye Dunaway), the other by a black farmer (Robert Hooks) whose mother (Beah Richards) was Fonda’s wetnurse. Interestingly, the film itself is not really as bad as its reputation warrants — and its inclusion in the Medved brothers’ The Fifty Worst Films of All Time (1978) seems highly suspect. By focusing on the intersecting fates of three “representative” southern households — one white and monied, one white and poor, one black and poor — the film does make (perhaps unintended) “statements” about class and race in the South, but the primary characters themselves are reasonably nuanced (though not all are provided with enough screentime for full development). Most impressive is Jane Fonda, giving a compelling performance in a pivotal role as an unhappily married woman forced to confront her husband’s deception and malpractice; the film eventually becomes her story, and she does a fine job investing viewers in the discomfort of her character’s increasing cognitive dissonance. 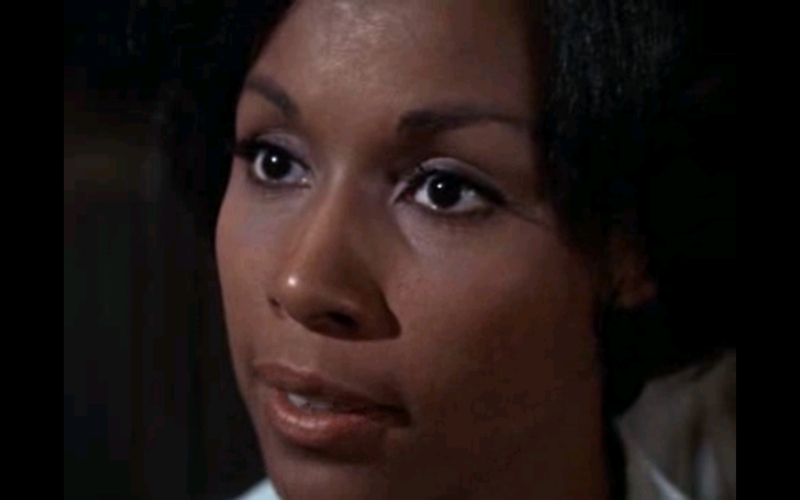 Diahann Carroll is also noteworthy in a small role that should have been fleshed out more fully. However, the film most definitely has its share of “bad movie” moments and performances. Both Burgess Meredith as a bigoted lawyer and George Kennedy as a buffoonish sheriff are laughably one-dimensional; Caine’s southern accent falters a bit too often (though he IS, naturally, believable as a caddish heel); and Richards (in a tiny, underdeveloped role) gives a sensitive, heartbreaking performance — up until the moment her heart LITERALLY “breaks”, and she melodramatically pantomimes an attack. Meanwhile, Fonda and Caine’s emotionally disturbed son (John Mark) is never convincing (nor is the lame back-story attempting to explain why he suddenly “became” the way he is), and a number of essential plot elements — such as Law’s unconvincing friendship with Hooks (why does he slip in and out of bigotry?) — are handled sloppily. Finally, Hugo Montenegro’s energetic film score is ultimately inappropriate (it sounds better suited for a western), and egregiously misused at times. With all that said, this is one you’ll have to watch for yourself to determine whether you consider to be an entirely skippable clunker, or a flawed but well-intentioned and occasionally compelling misfire. No, though film fanatics may be curious to check it out, given its historical notoriety. A tentative must – as its own kind of guilty pleasure. I can’t just always recommend movies that are genuinely worthwhile for one reason or another. I don’t think my appreciation of film would be what it is if it weren’t also for those peculiar movies that…took me to a different place, so to speak. The story behind the making of the…uh, anomaly that is ‘Hurry Sundown’ is probably best put at Wikipedia (so I direct you there for more of behind-the-scenes). It is not a great or even good film – but it’s intriguing enough, for me anyway, to watch while being a bit transfixed (which has now been twice). The novel (which I don’t know) was adapted by Horton Foote, who was let go and replaced by Thomas C. Ryan. Foote had, of course, adapted ‘To Kill a Mockingbird’ and would go on to write ‘Tender Mercies’. Ryan followed his ‘HS’ assignment with his commendable adaptation of ‘The Heart is a Lonely Hunter’. So, these are quality writers – apparently dealing with less-than-quality source material. Place a director in obvious decline on top of a dubious script and what does ‘HS’ leave you with? : a rather large, A-list cast attempting some kind of dignity, with or without the director’s help. In that sense, ‘HS’ is no exception. I honestly can’t fault the acting all that much (aside from what seems obvious directorial intrusion – i.e., Richards’ heart attack). [I can say, though, that I can’t BEAR Fonda and Caine’s WHINY WHINY WHINY kid! That whole thing is just plain WRONG!] Preminger clearly ‘encouraged’ the melodrama and, it seems to me, the cast tries to…adjust themselves by staying within some kind of reasonable veracity. What ‘HS’ also has in its favor is that it’s part of Preminger’s long-standing penchant for hot button topics. ‘HS’ is only one example of the director’s mission to throw controversial issues onto the big screen. Regardless of what you think of him or his films, that aspect of his career has always been an admirable one. Preminger made a number of decent films. Late in life, he started to flounder (sometimes very badly – i.e., the nightmare that is ‘Skidoo’). ‘Hurry Sundown’ falls somewhere in-between. It’s somewhat sloppy. It probably deserved to be received poorly overall. Nevertheless, I (hesitantly) recommend it to ffs. I can have reservations myself, but I can’t honestly call it a bore. Fave scene: During the trial, Carroll confronts Fonda in the ladies’ room and urges her to face the truth about Caine. Fonda’s scene with Carroll *is* truly noteworthy, and shifted the film into a different, more positive light for me — temporarily. Then, it was back to “dubious” melodrama. Your points about Preminger all seem fair and true. Yes, his selection of “hot button” topics IS admirable, and his intentions seem always sincere. It’s odd how his work really is all over the place — some films truly admirable and compelling, some merely middling. I have yet to watch “the nightmare that is ‘Skidoo'” but now am perversely looking forward to it!